Any citizen is only too well aware that protection of the historic and cultural heritage is an area (at least, one would think so) of a narrow professional interest, but extremely a high-profile one in terms of the conflict risks involved. To be more exact, this is how it can be rightly perceived thanks to the rhetoric and communication style of the activists, who are known by their tedious and gibberish lawsuits, histories of judicial or administrative proceedings, memoranda and petitions. This is why one of the objectives behind our project was to use, when speaking about the heritage, an easy and intelligible language, which is clear to everybody, in order to reach the hearts and minds of every resident, who quite often is remote from the theme of cultural patrimony conservation. By the way, there is a lot to talk about. The situation around Uzhgorod’s historic centre is a critical one. The city is promptly losing its face, while the real efforts made by the activists within the latest 10 years look no better than an attempt to patch up one’s makeup during a thunderstorm. The cultural heritage issue is seen by us as a bilateral one: there is no good will one behalf of the authorities, neither there is any understanding of it on behalf of the public. This is why the project consists of two big and interconnected blocks: the institutional one (working with the civil servants and competent authorities) and the educational one (mass-scale education among the residents of different ages and work with the public opinion through the mass media channels). – We have done some work to amend the Regulation on Signs in the City of Uzhgorod. All the alterations have been successfully approved by an Uzhgorod City Council session. After a conflict situation around a terrace along the central pedestrian only street Corso, we are developing amendments to the Regulation on Terraces and a new Regulation on the Authority Entrusted with Cultural Heritage Protection. We collaborate on a permanent basis with the representatives of the City Council, Executive Committee and their profile directorates or departments on the issues related to cultural heritage protection by trying to influence decisions made on tactical, as well as strategic problems. 2. In the educational block we have pursued an objective to modify our citizens’ attitude to the cultural patrimony. Wasteland begins in our minds, and it is exactly there that creation begins, too. – An Uzhgorodian’a School has become the most interesting, promising and attractive event. Having comprehended all the futility of the current activities conducted by the activists, we have changed our tactics. 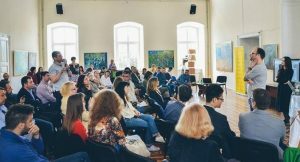 No, Old Uzhgorod cannot be redeemed, but we are capable of bringing up a new generation of citizens, who just in 20 years or so will form the city environment, and, we would love to believe, will do so with affection and respect of its history and a rational approach to its current needs. – Street exhibitions. Uzhgorod is Ukraine’s only city with whole surviving modernist neighbourhoods dating back to the 1930’s, including buildings designed by renowned European architects, original planning, landscape gardening, paving block design and even interior details. This is why our first exhibition within the project framework was entitled Uzhgorod Inter-War Period (1919 – 1939). 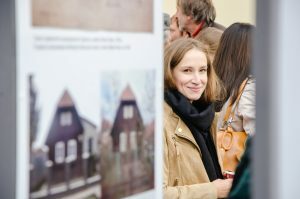 An open-space exhibition, which is accessible for several months, is a guarantee of interest for passers-by and publicity. The feedback I remember the best was as follows: Look, this is my house, is it valuable, too? – Educational materials. When working on the project website we used to argue a lot how to make it relevant and valuable for as many city residents as possible for a long span of time. In this way we developed an idea to create an interactive map of Uzhgorod’s architectural history uzh.city. 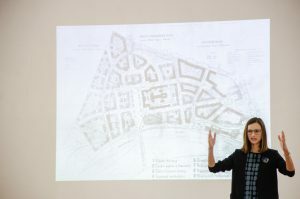 Its basis was provided by the Uzhgorod modernism map, which we have also printed within the project framework. The map contains data on the buildings in Uzhgorod’s historic part: year of construction, architect, architectural style, as well as a detailed article, if ready by the period of time in question. Uzhgorod’s architectural map is of a special value for the city, because no profound research into the architectural heritage has been carried out here so far, and most buildings even lack their certificates. We have plans underway to provide on the map some detailed information on every historic building. Due to our participation in the CHOICE project, we have re-thought our activist tactics and strategy, while the available funding has streamlined our activities to make them more concentrated and systemic. The institutional block has required from us massive efforts, but its results turned to be much more modest than we would like to have had. Probably, we have set for ourselves the objectives, which proved to be overly ambitious. It is hard to change anything faced by a bulky and cohesive system, which pursues a different set of objectives. Yet, the educational block was very successful. Dozens of publications on the local and national news websites, interviews and live coverage on TV and radio and hundreds of likes and reposts on social media serve to confirm it. It has become voguish to write and speak about cultural heritage preservation. We are glad that the reason for it has been provided by other people’s work, as well as by our efforts. We are also glad that during a strategic session (capacity-building event within the project framework) we have succeeded in bringing together all the cultural organisations and activists, many of whom share our values and help us in our projects, something we appreciate very much. During the year our project We Are the City lasted, our team experienced all kinds of things. And it has become stronger. 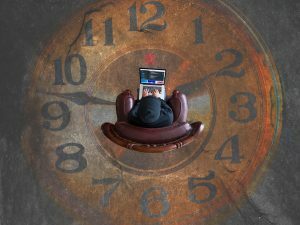 Certainly, it is not possible to change a critical situation within a year. However, now we are sure that as a part of the civil society we are in a position to influence it. Probably, we shall not succeed in preserving the Old Town, but we shall for sure succeed in preserving its memories and information.